If you wish to get married in Gironde, at Bordeaux, at the Bassin d’Arcachon, in Dordogne or in the Lot-et-Garonne, but you do not have the time or the knowledge to look for a chef who answers all of your requests, even less to find a creator of the invitations who understands how to personalise 100% your requirements? I offer you this ” Meeting the Bore.”. I put together for you the services who correspond with your requirements and I organise your wedding around you and your availability to present to you my plan. I am with you throughout the whole of the organisation. When we get closer to the d-day i will give you your planning. Also you will have access to change at any time anything to make sure the most beautiful day of your life will be a success. It’s the time where we get to know and to learn about each other. This first meeting is really about getting to know each other better. This meeting can take place by skype, whatsapp…Whatever is possible. 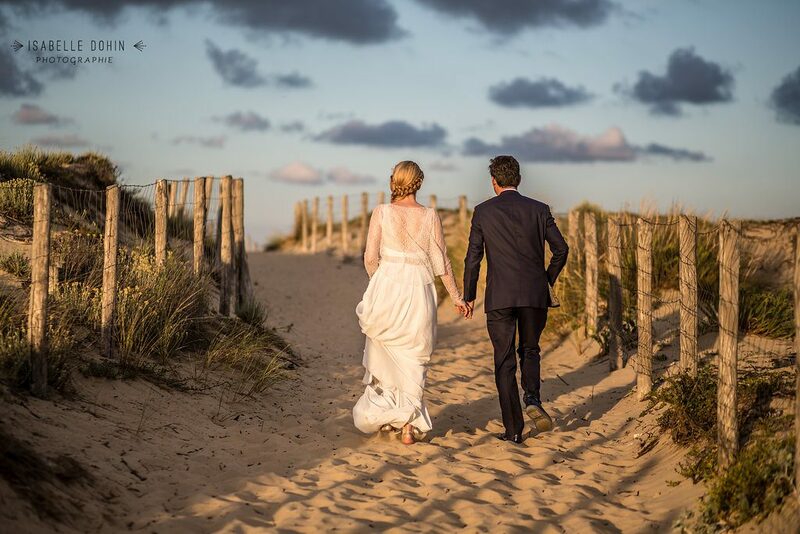 I will explain to you my role of a wedding planner in Bordeaux and also the planning of you preparations and we will exchange on ideas what you are expecting for your wedding. This is a moment of simple exchange, because the only objective is that you feel comfortable and confident about your choices. Secondly, my work consists of compiling all the information, this enables you to make your first choices and for me to put together an inspiration board. This inspiration board is an idea to put in place the aesthetical layout of the colours, designs, crafts, the location, etc… It will trace your themes and ideas and will accompany us throughout the preparations. Also on this inspiration board your budget will be closely managed, so that you can have an idea of what you are spending and to help keep track of your budget. During our second meeting on presenting to you our work so far, you will be able to at this point to choose if you wish to continue working with me for your Wedding project. At this point nothing is definite, I am only doing the blueprints! Want to change location? Menu? Your desires, your choices are respected, I am by your side to listen and accompany you depending on your choices. We don’t make any decisions without your approval: I guide, you choose! Obviously it’s a question of relationship and professionalism. Each service has a role in your wedding but you need to choose the one that pleases you and answers your demands. Which is the importance of knowing the different services available and does not only mean having a single partnership. Your budget will be monitored constantly and if any changes, you will be kept up to date. The budget monitoring is not only about your purchases BUT ALSO any of the reductions and price differences that the services allow me from which you will benefit from 100%. This is simply my way of giving you the aspect of your event, all of this is thanks to my formation in “Wedding Designer”: I create an inspiration board that corresponds to you and your ideas, to keep or change according to you and the details of your event, so that everyone will remember that special memory all because of the help of the board. MY wish? To hear you express that famous WOW! There is nothing more comforting then a list with all the wedding organisation listed clearly, grouping all of the services, locations and times of your D-DAY. It’s our role to make this happen for you but also for all the team who i will be working with so that this day can happen in the best way. Because your wish is to have a ceremony that reflects your personality, tailored for you and allows for your family to take part, I will put you in contact with THE specialised provider in the region. For this price, you may wonder if there are any guaranties that come with my work? • you benefit from liberty of choice, there is no contract signing until you have a taste of my work. • I am here to listen to your requests and to give you our opinion, this is so that things are clear and you can have the Wedding you would like within your budget. If you wish to consult other guaranties that come with my work? We invite you to click on ICI and LA.